Create a delicious appetizer platter with NEW PHILADELPHIA Dips. This sponsored post is in partnership with The Kraft Heinz Company. All thoughts and opinions expressed herein are my own and not influenced by the company and its affiliates in any way. Let me help you take the stress out of planning the menu for your next upcoming casual party with this appetizer platter featuring PHILADELPHIA Dips. 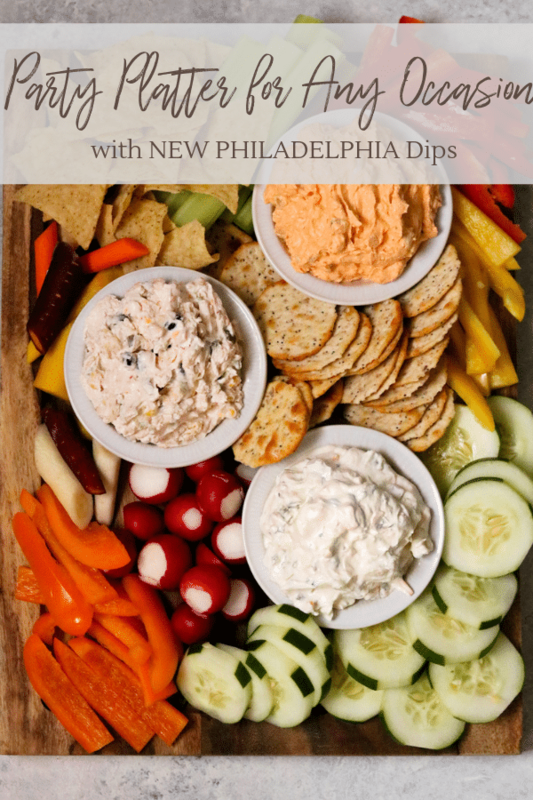 Whether you are planning a small gathering with friends or a family night in, PHILADELPHIA Dips makes creating a delicious appetizer platter quick and easy. You know I love to host casual get-togethers, and one of my favorite meal planning hacks for parties is creating a simple yet elegant appetizer platter. My guests love them, and they’re so quick and easy to put together. PHILADELPHIA recently released NEW PHILADELPHIA Dips that come in three flavors: Jalapeño Cheddar, Southwest Black Bean & Corn, and Buffalo Style with Celery. Each flavor pairs perfectly with crackers, chips, or vegetables. That’s the best part about creating a delicious appetizer platter, you can easily customize it and make it your own by pairing your favorite vegetables and chips with each flavor of PHILADELPHIA Dips. 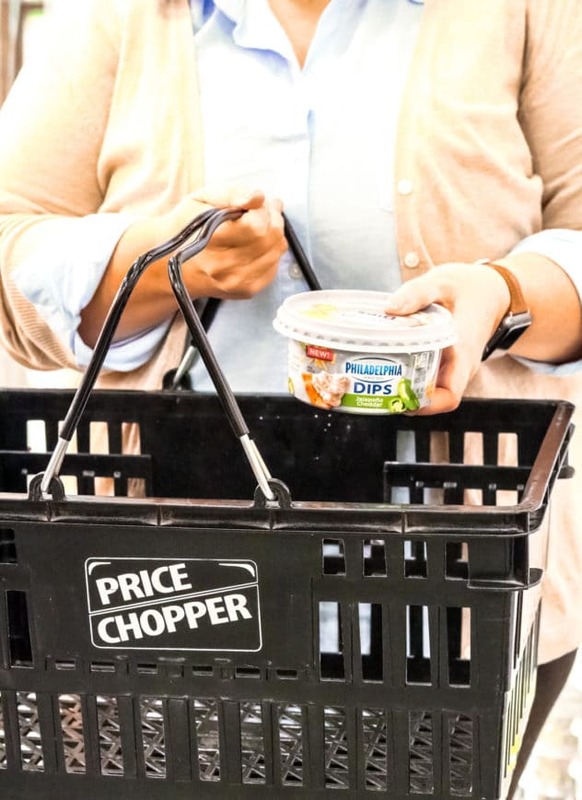 The NEW PHILADELPHIA Dips come in three rich and creamy varieties and are now available at Price Chopper! The Buffalo Style with Celery is the bomb dot com if you love all things buffalo! The Jalapeño Cheddar is so rich and creamy, and the Southwest Style Black Bean & Corn is 5-star on that southwest flavor! The simplicity of this appetizer platter is that I can quickly stop by the store and grab one of each of these new flavors plus my favorite veggies and I’m on my way to crafting a delicious appetizer platter for my party! 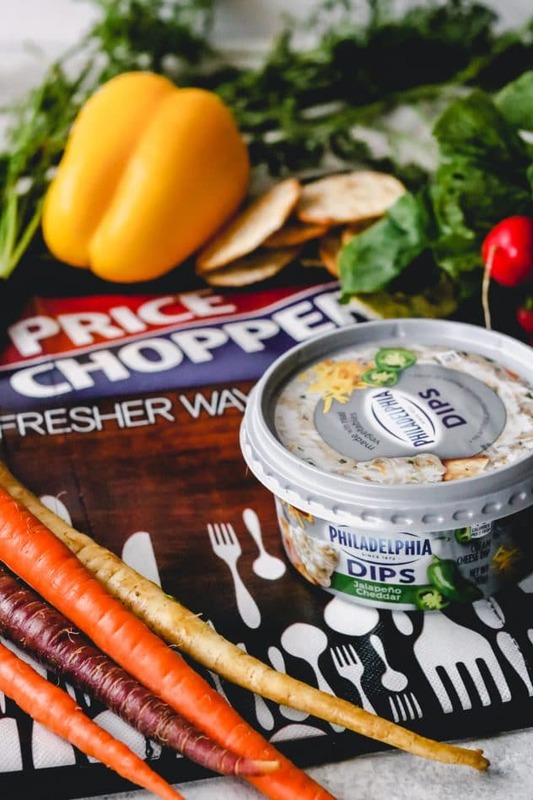 You can find the NEW PHILADELPHIA Dips with the other refrigerated dips at your local Price Chopper. Let’s get started on building this amazing appetizer platter, shall we?! 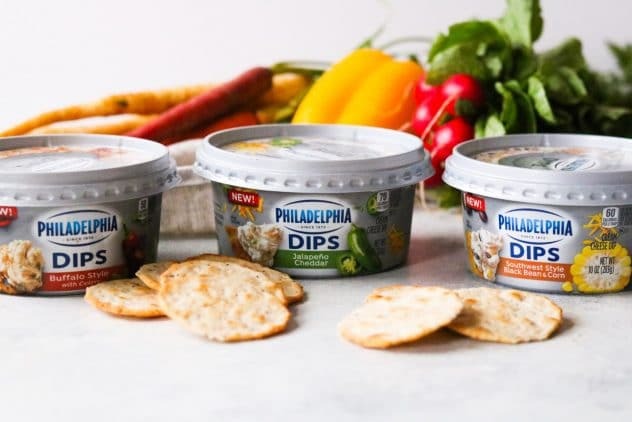 After grabbing one of each PHILADELPHIA Dips flavors, select which vegetables, chips, or crackers you want to pair with each dip. 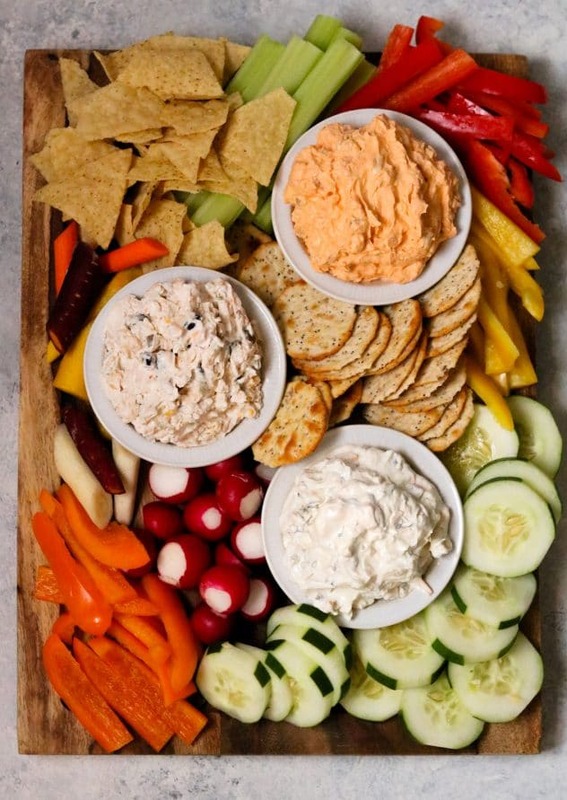 PHILADELPHIA Dips are made with the goodness of PHILADELPHIA Cream Cheese and real vegetables, so pairing them with additional vegetables creates an oh-so-delicious appetizer platter your guests will love. Celery and crackers pair amazingly well with the Buffalo Style with Celery flavor. Fresh peppers and tortilla chips pair well with the Southwest Style Black Bean & Corn flavor. The Jalapeño Cheddar flavor is so rich and creamy, pairing well with radishes, cucumbers, and carrots. Once you have everything for your delicious PHILADELPHIA Dip appetizer platter, head home and start assembling. Just cut and prepare your vegetables and then arrange your vegetables, chips, crackers, and PHILADELPHIA Dips onto a large serving tray. In just a matter of minutes, you’ll have a gorgeous appetizer platter ready for your guests when they arrive. My guests devoured this appetizer platter, and I loved knowing it was so quick and easy to assemble! This simple yet elegant appetizer platter is perfect for your next party. I love that you filled up your party platter with veggies, looks stunning and so yummy! This will be added to your holiday table this year. I have always loved these spreads and can’t wait to see how the family enjoys them as well. I’m already a lover of Philadelphia cream cheese spreads, so I know that these dips are going to be a necessary purchase for the holidays! I can’t wait to try the buffalo with celery! I never would have thought to put the celery IN the dip! Brilliant! Yum, I want all those dips! This platter is gorgeous and would be perfect for a holiday party. I’ll have to check out these dips. They sound delicious, and perfect for the holidays! These dips sound delicious! I’m going to have to check them out the next time I go shopping and just perfect for this time of the year. Oooo! I want to try ALL of these cream cheese dips. They sound so good and I didn’t know they existed! This platter is perfect for the holidays! What an effortless way to entertain. So simple and easy. I love Philadelphia cheese, I must look for these flavors. Sound so good and would make a weekend snack an absolute treat. What a great way to serve guests this holiday season. I have always loved Philadelphia dips and this is a great way to serve them. I love their cream cheese! I’m sure these dips are all amazing. SO good to know they’re out there! I had no idea!!! They all sound pretty tasty but I’ll be picking up the Southwest Style Black Bean and Corn variety!